We didn’t often stop for a proper lunch but today, after 25 hot and not entirely pain-free kilometers, we threw off our packs and sat down at a street table in Cacabelos and ordered tapas: juicy mussels, potato croquettes, bread, water (with painkiller) and wine. Mmmmm. The waitress brought us a complementary bag of ripe figs from the garden too and those we ate at the table were delicious. The others didn’t travel too well. 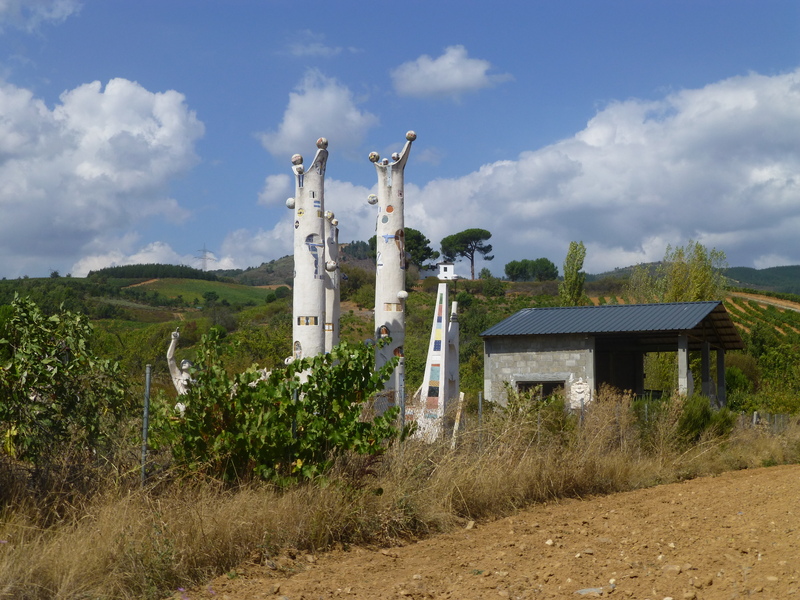 The food slowed us down so it felt like a hard slog through the endless vineyards where workers were harvesting grapes, past a sculpture workshop and its strange colourful work outside and finally into Villafranca where we searched in vain for the “albergue with nice gardens”. Turned out it had been burned down and the gardens abandoned to weeds. The last albergue on the outskirts of town was “completo” but Libia, the young co-owner served us tea and biscuits while she called around local guest houses and hotels. 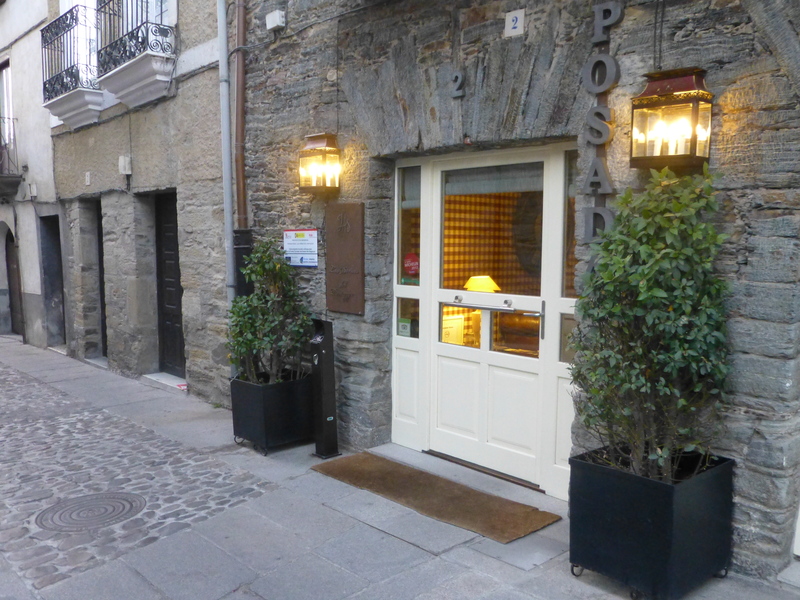 Everything was full, apart from the “boutique” hotel, Las Doñas back down by the bridge. So… the choice was between heaving on our packs and limping on to the next town 12m away or succumbing to white sheets, a bathroom with toiletries, clean fluffy towels and an all singing-dancing shower. Tough decision. I met an old man in the street later that evening who was anxious to point out a plaque on a house marking the birthplace of the Spanish “famoso” poet, Enrique Gil y Carrasco. We conversed for some time (despite my limited Spanish) about national poets, I heard about the pride he felt about this native son and he listened to a wee bit of Robbie Burns right there in the fading light of the pilgrim way. We parted with great affection and hand shaking. 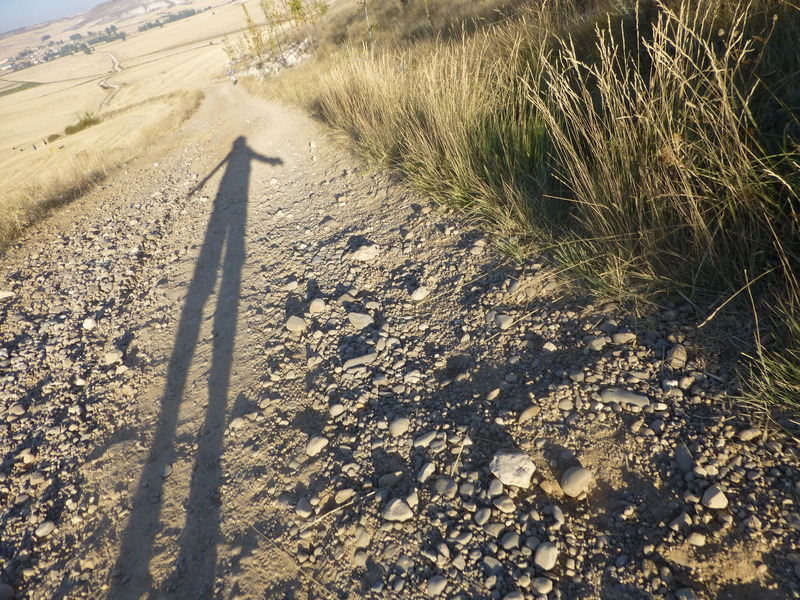 It’s moments like these that make the camino unforgettable.